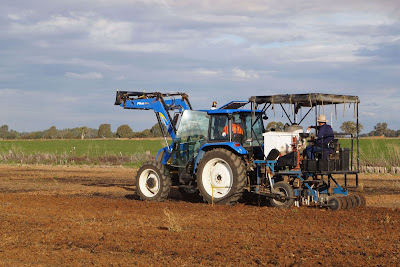 Precision sowing of the trial plots. I am always impressed that precision is possible using such big machines. Yes, I know, I am displaying my ignorance. I do agree it is quite amazing. GPS guidance is now available in tractors that pinpoint location with exceptional accuracy of down to 2cm. Incredible technology! Is this test plots of alfalfa (or clover, as you call it)? In the U.S., we see test plots of wheat, corn and soybeans, but, at least around here, we don't usually see alfalfa test plots. My brother and dad usually do some corn test plots for a company. Interesting! This trial is for oat varieties on irrigation, and it is the second year this company has used our land for the trials. Last year we also had trials on non-irrigated (dryland) for canola, safflowers, lentils, vetch, field peas & faba beans. We also have an ongoing five year variety trial for alfalfa. It is fascinating to watch the trial plots at the different growth stages as they grow and mature at different times. In Australia we call alfalfa lucerne. Clover is clover universally I thought... unless maybe you call it trefoil or trifolium? It is a legume like alfalfa but in a cropping program clover is an annual, not a perennial plant. I can smell the dirt! I hope you take photos of the plants...I would like to see them all. This year we will only have the oats trial happening – but if you have a look at the "cropping" category on this blog the first page of results comes up with a few photos of the trails that where conducted last year on our farm.